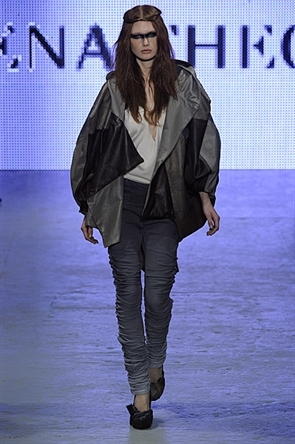 I love the super hero mask look – it makes the collection so edgy and “in your face”. 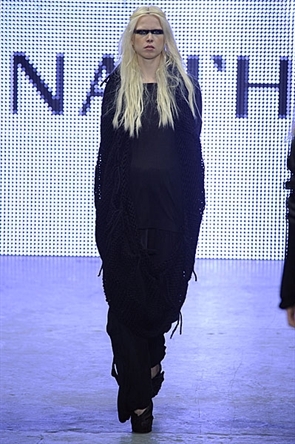 I also have serious hair envy – I love the relaxed, boho vibe that the hair stylists created on the models. There is something quite animalistic about this collection and I adore the drama and the dark colour palette used. I live in capes / shawls and Jena Theo’s cover ups just look so comfortable and practical for everyday life. And this is an achievement in itself, as not everything seen on the catwalk is practical for us mere mortals. 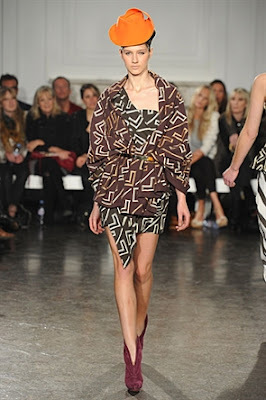 I am a girl who worships Aztec print and Matthew Williamson’s use of colour for his dresses is just incredible. His blue version would go with the turquoise jewellery du moment to perfection. And the coral Aztec dress is so inspiring that it would break even me - of all people - out of my dark colours style rut (I live for black clothing). And how cute is the jacket? I love the use of lines and I can imagine it flowing in the breeze with every step I take. 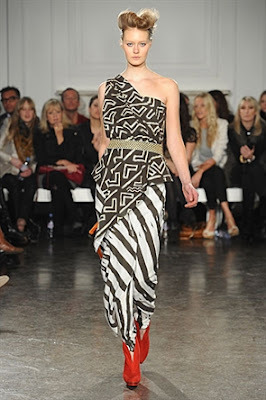 Sass & Bide have a real tribal feel to their collection featuring vibrant orange hues that are trending and oh-so-hot right now. I am seriously smitten with the patterns on show – I would love a poncho / bed jacket / cape like this. I am in love with the burnt orange / rust / not sure what to call it / colour that was prominently featured. It’s not a colour that I’ve worn before, but I’d love to own those shorts and that one shoulder knit dress. My absolute favourite. But then I’ve always been a big fan of Temperley. I love this collection as it looks so wearable – I can actually see myself wearing most of it (if only I had the money!!). Bear witness to flowing, silky fabrics (gotta love that champagne coloured dress!) 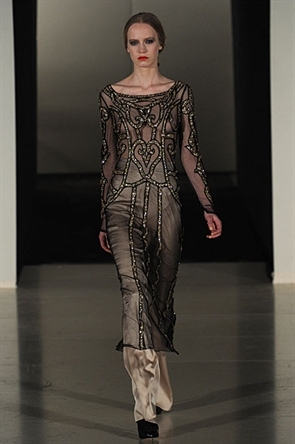 and the intricate attention to detail of the embellishment combined with sheer fabrics. My favourite piece? It’s a difficult choice… But I am crazy about the white belted dress. So, what’s new in my life? My cape / poncho obsession has reached a whole new level. I bought not one but three this week from H&M. Awful. Tesco now officially hates me. I spent £2.04 on a magazine and some chocolate and paid them with a single pound coin and the rest of it in two pence pieces. My purse is happier and much lighter for it though. Great post, and don't worry I still haven't had time to post about the shows so you're ahead of me! I LOVE the fur in Matthew Williamson's collection! So chic! Wow! I had no idea who Jena Theo was before this post. AWESOME. OMG. I worship aztec print too. Are we twinnies? We must be. I want everything in that group of pictures. Note to self: must go check out ALL pictures from that collection and dream of owning everything. I love the Matthew Williamson collection but I also have an undying love for Temperley!